Little Barn01263 715779work01603 870304fax Self-cateringLittle Barn is an attractive barn conversion in the sweet village of Thurgarton. Enjoy relaxing by the cosy woodburner in this open plan living area vaulted ceilings and beams. Situated next door to the owners house, a perfect quiet location in which to enjoy a warm day in the private courtyard garden and enjoys meal for two alfresco. Little Barn is an attractive barn conversion in the sweet village of Thurgarton. 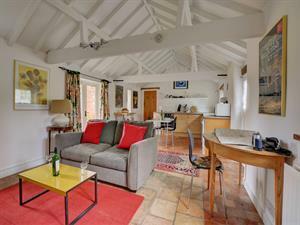 Enjoy relaxing by the cosy woodburner in this open plan living area vaulted ceilings and beams. Situated next door to the owners house, a perfect quiet location in which to enjoy a warm day in the private courtyard garden and enjoys meal for two alfresco.